Protest leaders outside PM's Residence blame Netanyahu's "immoral" policies for latest wave of terror attacks in Binyamin region. 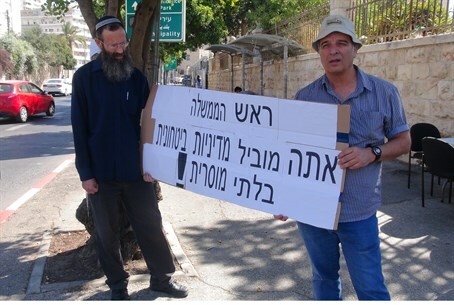 Yesha Council chairman Avi Roeh and head of the pre-military academy in Eli, Rabbi Eli Sadan, arrived Wednesday to the Prime Minister's Residence to protest a wave of terror attacks that have struck the Binyamin region in recent days. Blasting Israel's current security policy, as led by Prime Minister Binyamin Netanyahu, as "immoral," Rabbi Sadan told Arutz Sheva that "for every attack, there must be confirmed within 24 hours, 200 new housing units." Throughout the day Wednesday, students and alumni of Eli's pre-miliary academy, as well as residents of Binyamin in Judea-Samaria, are expected to join Roeh and Sadan in Jerusalem. A full-scale protest outside of the Prime Minister's Residence is scheduled for 6:30 p.m. Wednesday night. "Within ten days, two Jews were murdered in Binyamin. We cannot just roll over and keep quiet against a surging wave of terror," Roeh wrote to residents on Wednesday morning. "This morning I went out...and called for a change to the policies that have lead to this situation. I encourage you all to join me in a large protest rally, outside the Prime Minister's Resident, which will be held today, Wednesday at 6:30." "We cannot remain silent," Roeh asserted, "as it clear to us that murderers are not looking for one person or another, but are looking to kill a Jew because he is a Jew, and the next victim could be any one of us." "At the rally we will call on the Prime Minister for a clear policy change: no surrendering to pressure, an unequivocal demand to eradicate terrorism and building and strengthening throughout our country." The protest comes in the wake of the murder of Malachi Moshe Rosenfeld, 26, who was critically injured in the shooting attack Monday night outside Shvut Rachel, and succumbed to his wounds on Tuesday. Rosenfeld's funeral is being held Wednesday at 11:00 a.m. in Kokhav HaShahar.